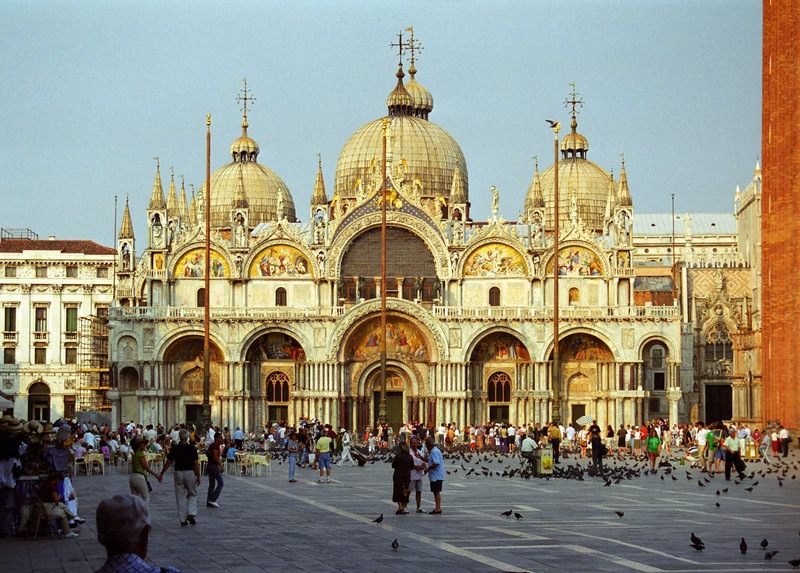 St. Mark's Square or Piazza San Marco is the place to visit when you travel to Venice. 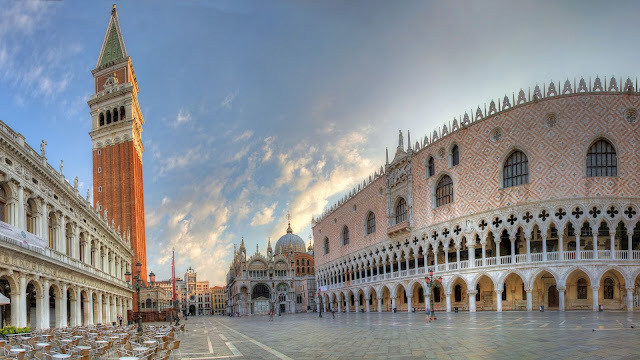 It was constructed in the ninth century as a small square, as part of the Doge's Palace, in front of the original St. Mark's Basilica It was then enlarged around 1170 and was further enhanced with the herringbone patterned bricks in 1267. The bricks were replaced by the natural stone, which was laid in a more complicated pattern by architect Andrea Tirali. As the largest square in the City, it is the heart of the city where the important government buildings and other important facilitates of the city stand. 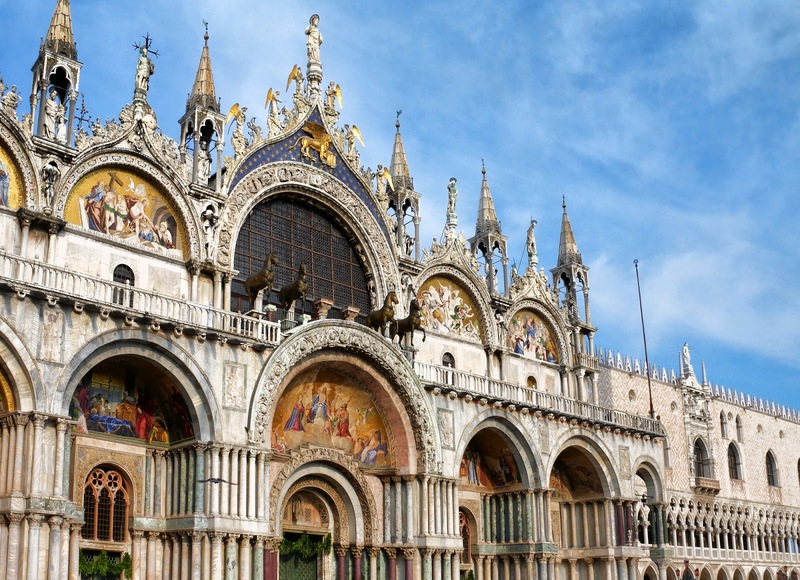 The most prominent landmark for the square is the amazing church of ST. Mark's Basilica. It was commissioned in 1070 by doge Domenico Contarini with Venetian-Byzantine style mixing eastern and western styles at the time. It has earned a nickname of "Church of Gold" due to its luxuries design. The origin of the church bears important historical background which not only has significant religious and cultural importance but also of practical economical value to Venice. The church contains the remains of evangelist St. Mark . 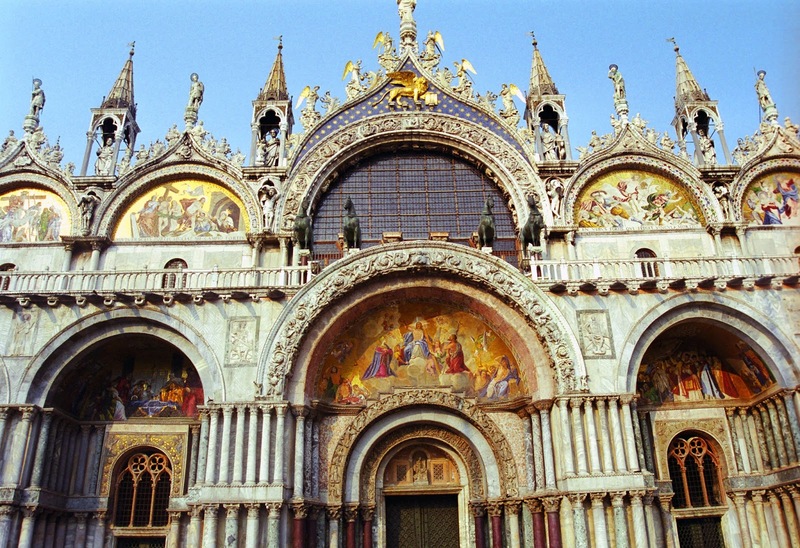 Back in 828 A.D., merchants secretly stole St. Mark's remain from Alexandria back to Venice. Rumor has it that the merchants had to hide the saint's remains in a chest full of vegetables and pork to avoid Muslim control at the time. When the full collection of the saint's remain eventually collected was put back in full, it was such a triumph for the city. Doge Domenico Contarini built a church for the tomb to celebrate, which is the St. Mark's Basilica we are seeing today. Having a church built to house the saint's body turn out to be a great economy attraction for Venice. 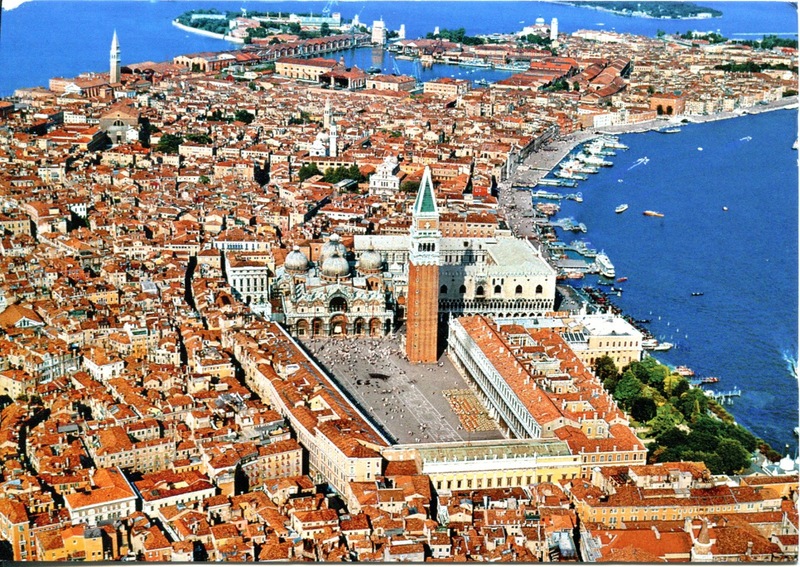 In the Middle Ages, having the "full body" of the saint is absolutely valuable for the city and attracts a lot of merchants to tourists to visit Venice, which meant significant economical values. The church facade is a gothic masterpiece, a rich composition of columns, arches, spires and reliefs that represent a typical medieval church. 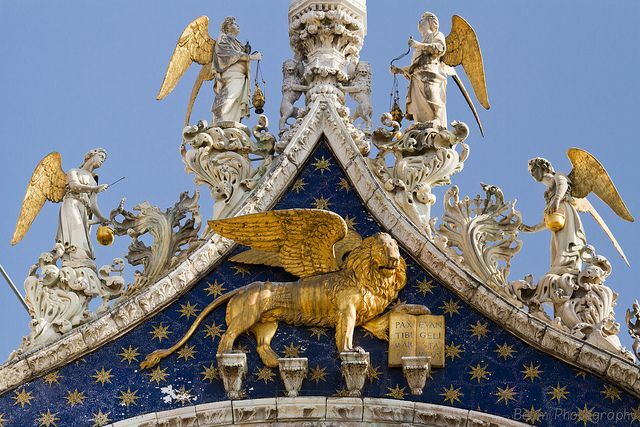 Located at the top of the facade lies the symbol of St Mark, a winged lion armed with a sword. The symbol has subsequently became Venice's city emblem. A simple symbol to represent civil virtues, strength and courage. The picture within the facade also shows an old man biting his hand. Legend has it that this is the church architect being removed from his position after he said he could have built an even more beautiful one because people cannot accept that the church could be inferior. Other than the historical value, the church itself is a masterpiece of architecture. The structure is enormous: five great arches support five gigantic domes. The magnificent golden gleam of the mosaics that impress every visitors. It was actually constructed by carefully laying each tiny squares in different directions or angles in order to create such complex mixture of lights. Another landmark building in St. Mark's Square is the campanile, a bell tower, of 98.6 meters tall. Originally built in the 19th century, it was rebuilt in 1912 after it collapsed in 1902. On top of the tower stands a golden statue of the Archangel Gabriel. The statue itself is 3 meters tall with a pair of wings. These wings capture the wind and make the statue spin around. When the angel face the Basilica, Venetians know that the water level will be high. The 5 bells in the tower have special function themselves as well. The Nona chimed on the ninth hour and the Marangona (from "marangon", or carpenter) chimed in the morning and evening – to mark the beginning and end of the working day. The Maleficio bell announced those condemned to death. 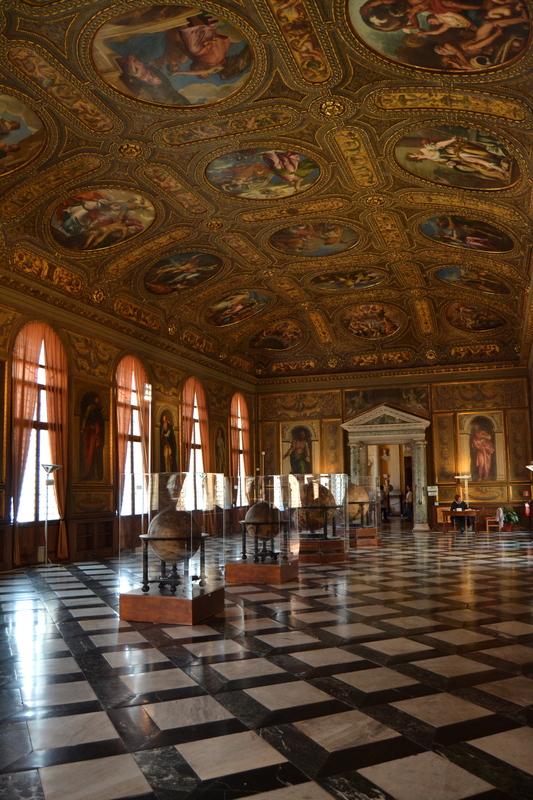 The Trottiera and the bell of the Pregadi called the judges and senators to their seats in the Doge's Palace. 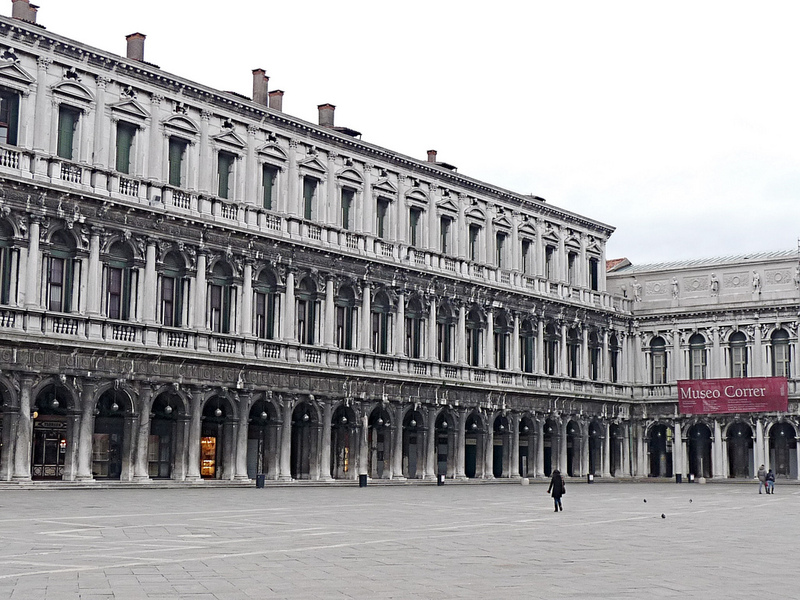 Facing the Venetian lagoon is another dominant building around St. Mark's Square is the Doge's Palace. A beautiful Gothic structure. It was built in fifteenth century and was rebuilt in 1574 after a fire. There are other classical buildings in the square. The twelfth century Procuratie Vecchie are buildings that housed the apartments and offices of the procurators; the Procuratie Nuovo provided more offices and was built in the mid-seventeenth century. 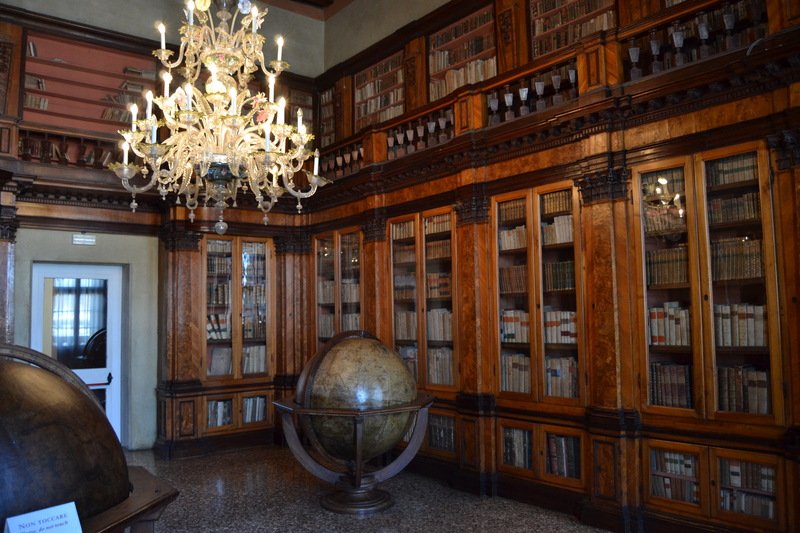 There are also the National Library of St. Mark's; the Museum of Archaeology and the Correr Museum.